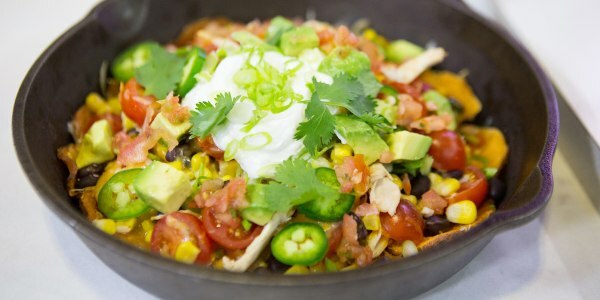 Nacho average nachos — try this delicious recipe tonight! Thanks to one secret ingredient, I discovered a healthy way to serve up cheesy "chips" loaded with hearty goodness. And, once you've polished off the last bite, there's even room for dessert. Sip on a refreshing cherry slushy that's low-calorie, packed with nutrition and doesn't contain a drop of added sugar. Seriously. Nacho time! In my slimmed down version, I said "ta-ta" to fried triangular tortillas and subbed in thin and crispy sweet potato slices. You'll get a shot of beta carotene and fiber, so you can feel good about digging in. Add your favorite toppers for one fantastic fiesta. No utensils required. If you have fond memories of slurping down a sugar-laden slushy as a young kid, then I've got fabulous news: I created a refreshing, new-and-improved version made with only good-for-you ingredients for a cool 110 calories. And did I mention it has absolutely no added sugar? All the natural sweetness comes from two delicious fruits that also provide a dose of fiber and antioxidants. It's a cinch to make and totally kid (and adult) approved. Sip sip, hooray! For more delicious recipes, check out Joy's cookbook From Junk Food to Joy Food. Want Joy to make over your favorite fattening dish? Challenger her via Twitter, Facebook and Instagram.